On November 10, 2018, the Pennsylvania Department of Environmental Protection (“PADEP”) published a notice in the Pennsylvania Bulletin announcing proposed substantive revisions to the Management of Fill Policy, 258-2182-773 (the “Policy”). The proposed changes to the Policy represent a comprehensive overhaul of the existing version of the Policy and will have broad impacts within the regulated community, affecting, among others, real estate developers, land owners, railroads, port operators, public utilities, municipalities, excavation contractors, and environmental consultants who regularly support such entities. Activities and projects involving earth disturbance and excavation work including Brownfields projects, development projects, infrastructure projects and utility projects are likely to be impacted. PADEP has invited public comment regarding the proposed revisions to the Policy. The public comment period will close on January 8, 2019. Some of the most important changes that PADEP is proposing to make to the Policy involve deletion of the numeric standards defining “clean fill” found in Tables FP-1a and FP-1b of the current Policy that were developed in 2004 based on the residential cleanup standards implementing the statewide health standard under the Pennsylvania Land Recycling and Environmental Remediation Standards Act (“Act 2”) then in effect. Instead, PADEP intends to incorporate by reference standards for clean fill based on the lower of the current residential direct contact numeric values for soils and the residential soil-to-groundwater numeric values (based on protection of used aquifers) established under Act 2. For a number of the regulated substances listed on the tables, more stringent numeric standards will immediately apply once the revised Policy becomes effective. For example, the proposed revisions will result in significant reductions in clean fill limits for substances such as semi-volatile organic compounds and metals which are ubiquitous in urban environments. Of concern is the fact that the clean fill limits for benzo(a)pyrene and vanadium are expected to decrease from 2.5 mg/kg to 0.58 mg/kg and 1,500 mg/kg to 15 mg/kg respectively, adding complexity to projects using materials sourced from urban environments. PADEP is also proposing that fill containing polychlorinated biphenyls (“PCBs”) at concentrations in excess of 2 mg/kg may only be used if prior written approval is obtained from the United States Environmental Protection Agency. Since issuance of the current Policy in 2004 (with minor amendments in August 2010), the cleanup standards under Act 2 have been revised a number of times (including in 2011 and 2016). Additional revisions to the cleanup standards under Act 2 are anticipated in 2019 or early 2020 consistent with PADEP’s desire to update the standards every three years. It is our understanding that PADEP anticipates that these new cleanup standards will automatically be incorporated into the Policy, thereby resulting in further changes in the numeric standards for clean fill moving forward. In some cases, we anticipate that the new cleanup standards under Act 2 will result in further decreases in the numeric standards for clean fill. Although the proposed revisions to the Policy retain key structural elements of the existing Policy, there are numerous changes that warrant close consideration. For example, PADEP has proposed categorically to exclude dredge material from the types of material that can qualify as clean fill without any explanation of this fundamental modification. The proposed changes to the Policy also include extensive amplification regarding the requirements that must be satisfied in order to qualify fill material as clean fill, ranging from due diligence requirements to sampling protocols. The extensive revisions to the Policy that are proposed raise many important questions that will need to be addressed during the pending public comment period. For example, while PADEP has proposed an approach to quantify background conditions due to the ubiquitous presence of regulated substances resulting from atmospheric deposition (e.g., benzo(a)pyrene), which could potentially qualify greater quantities of fill as “clean,” the corresponding sampling and analytical requirements for both donor sites and receiving sites may effectively limit the ability to pursue this option given the anticipated reluctance of many receiving sites to allow soil sampling as a condition to accepting the fill. In addition, while PADEP has indicated that fill material that is placed before the revised Policy goes into effect is not subject to the revised Policy unless that fill material is subsequently moved, there are a host of issues that must be resolved as to the status of fill material that has been acquired and/or moved but not yet placed as of the time that the revised Policy goes into effect. The importance of the “grandfathering” issue is magnified by the fact that the numeric standards for clean fill will likely be changing every three years as the cleanup standards under Act 2 are updated. Questions also remain concerning the appropriateness of the proposed clean fill limits and the manner in which the cleanup standards under Act 2 have been used to derive those standards. 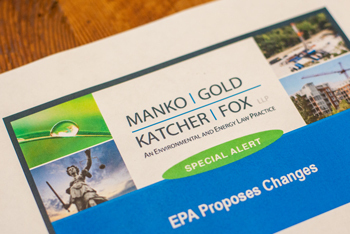 Manko, Gold, Katcher and Fox, LLP is currently developing written comments on PADEP's proposal and strongly encourages potentially impacted parties to submit comments on the proposal. If you have questions or concerns regarding the proposal or would like to submit comments to PADEP, either individually or as part of a group, please contact either Michael Meloy (484-430-2303) or MGKF senior technical consultants Michael Nines (484-430-2350) and Darryl Borrelli (484-430-2302).